The inane ramblings of a leaflet & flyer distributor. Weather wise, April was fairly good for delivering leaflets and flyers across Worthing, plenty of dry days, lots of sun and above average temperatures – a result! The main project this month was to source a new additional shed, sort out a base for it and get it erected, somewhere to store client’s leaflets and flyers, as the volume of boxes building-up in the conservatory was getting out of hand. There was pressure on to get the situation sorted and under-control before the summer arrives, so we can re-claim the conservatory for its intended use. I had no idea just how expensive sheds were until I started to look around locally, so I ended-up finding a 12’ x 8’ monster on Amazon for about £400 from a company called Walton Garden Buildings, which seemed reasonable. Then I checked on their own website and found it was even cheaper, coming in just under £370, which as with the listing on Amazon included free delivery – bargain! They also offered an erection service for £170, but as I am always looking to keep expenses down, I roped in my brother to help, and between us we had the thing up & finished in about 6 hours. It was hard going, and subject to some swearing during the operation, but what the hell, it saved me £170, and it was payback for me helping him with a new patio. Two clients, who will remain nameless, had problems with their campaigns this month. One had a great idea to include their leaflet inside a little party bag, and seal the bag with a little promotional sticker. The idea being that anyone finding a party bag on their doormat would, of course, open it to see what was inside – increasing the chances of the client’s message being seen and getting attention. What they didn’t consider was how long it would take to stuff & seal 10,000 party bags! So, when I was due to pick-up the first lot for delivery only a fraction of the number were ready, roping in friends and family members to help, they were just able to complete enough in time to meet the delivery schedule. It was a bit of a pain having to pop into their offices every few days to pick-up additional batches as they were ready, so I could get them to the lady that makes-up the bundles of leaflets & flyers for me prior to me delivering them, but we managed to work around the situation to help the client out. Somehow, I think they will be having nightmares about that little operation for some weeks to come! The other client wasn’t so lucky, and their problem was unfortunately something beyond what I could help with. They had had a great idea to change their flyer design for a new offer and make it a bit quirky, and they did a great job – it was very eye-catching and I am sure it would have resulted in an increased response. However, there was a wee problem – they had taken an image off the Internet and used it without permission from the copyright holder! Oh dear, the proverbial hit the fan when someone I delivered to raised a complaint, and I got a panicky call from the client asking me to cease delivering the flyers straight away. Seems easy enough, apart from the fact that over 3,000 more flyers had already been made-up into bundles ready for delivery, so I spent the best part of 5 hours unpicking their flyers from all the bundles – something I could have done without. When they withdraw the delivery, I didn’t think to say that I would need to charge them for the time taken to unpick their flyers from the bundles, because I didn’t expect it to take as long as it did. So, although I suspect I would be within my rights to charge them, on this occasion I decided not to, however, I have added a paragraph to my terms & conditions to cover any such eventuality in the future. So, what should be an extremely simple business operation has thrown-up a couple of very odd situations this month! Anyway, onwards and upwards, with fingers very firmly crossed for another great summer this year. Great start to the month, with plenty of sunshine, no rain, and above average temperatures – what a massive improvement on the endless rain we had in January & early February. Perfect weather for delivering leaflets & flyers, with the added benefit of topping-up what was left of the great tan I got last year. It does amuse me when some people assume I’ve been away somewhere hot, and how surprised they are when I explain that the tan is simply the result of working outdoors. The downside of the better weather, is it brings out the occasional person who will come out of their house, sometimes even running down the road after me if I’ve managed to get a few houses ahead of them, to have a moan about having the leaflets & flyers put through their letterboxes. I can understand that with the number of distribution companies delivering across the Worthing area, the volume of leaflets & flyers being delivered is high, but with all the problems in the world worth getting seriously upset about, I don’t think this issue is one of them. I always explain that if they consider it that much of a problem, just put a little sign on the letterbox saying ‘No Junk Mail’, job done. Most people seem happy with this advice, although I had one complete nutter this month who took offence at this simple solution and went off on a complete rant – “I don’t have to f**king do that, why the f**k should I have to do that, why can’t you c**ts just f**k-off”. Charming! Funny thing is I didn’t see what house he came out of, and when I asked what number he was, so I could avoid delivering there in future, I was told, “none of your f**king business”, before he stormed off in the opposite direction from where he came from. Therefore, there’s no way I can avoid delivering to his house again, what a strange little man. I did chuckle afterwards, as I wondered what on earth was going on in his life to get him so worked-up over something so minor. I suppose it takes allsorts, doesn’t it? Having only launched the website in January 2014, it was great to have it leap forward to the top of page one for the key searches on Google this month, increasing the number of enquiries. So, instead of chasing potential clients that had expressed an interest in doing a leaflet or flyer drop in order to get them booked in; I’ve been struggling to fit in deliveries for all those calling me! It’s nice being fully booked two months in advance, but I can see the point arriving where I’ll end-up turning business away, as I’ll not be able to accommodate their requirements, which will be somewhat gut-wrenching. Leaflets & flyers are delivered to a total of 3,000 households in the Lancing & Sompting (north) area. 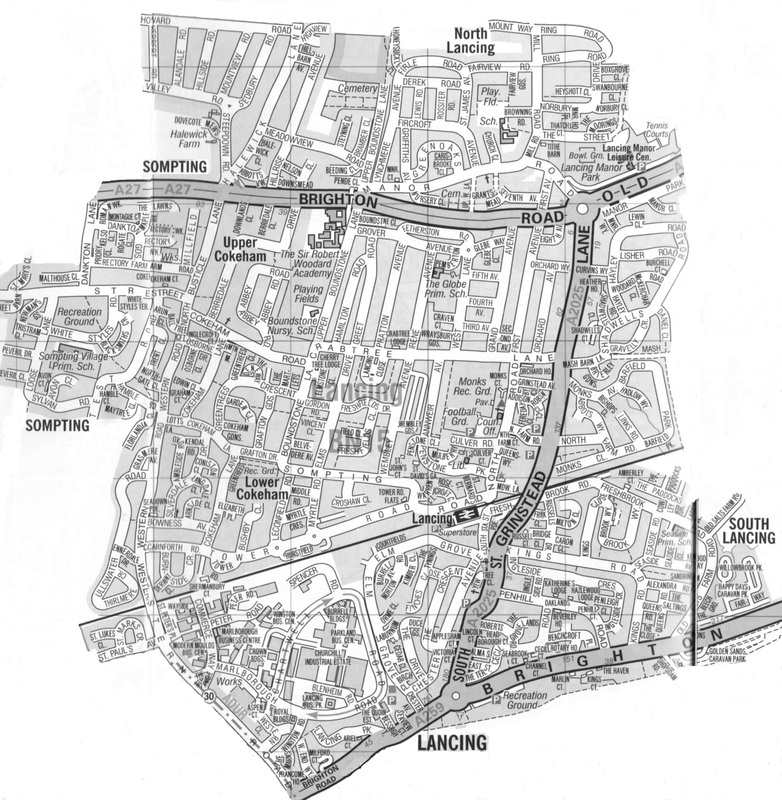 The Lancing & Sompting (north) delivery area is a new round starting in July 2014, together with its sister round of Lancing & Sompting (south) delivery area (5,000 households), the above map shows the total coverage area of both of these delivery rounds. Once the rounds are completed for the first time, the dividing line between the two delivery rounds will be known and this map will be split and updated on the site. For clients wanting to target all of Lancing & Sompting (total – 8,000 households) it is suggested you consider also booking the neighboring East Worthing delivery round (2,000 household) in order to round-up your booking to a total of 10,000 households. 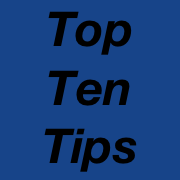 Leaflets & flyers are delivered to a total of 5,000 households in the Lancing & Sompting (south) area. The Lancing & Sompting (south) delivery area is a new round starting in July 2014, together with its sister round of Lancing & Sompting (north) delivery area (3,000 households), the above map shows the total coverage area of both of these delivery rounds. Leaflets & flyers are delivered to a total of 4,000 households in the Central Worthing area. The Central Worthing delivery area is situated east of our West Worthing, west of our East Worthing and south of both our Tarring & Broadwater delivery areas. It is situated between the main railway line to the north and the coast to the south, both Worthing town centre and the High Street fall within the area. Leaflets & flyers are delivered to a total of 2,000 households in the East Worthing area. 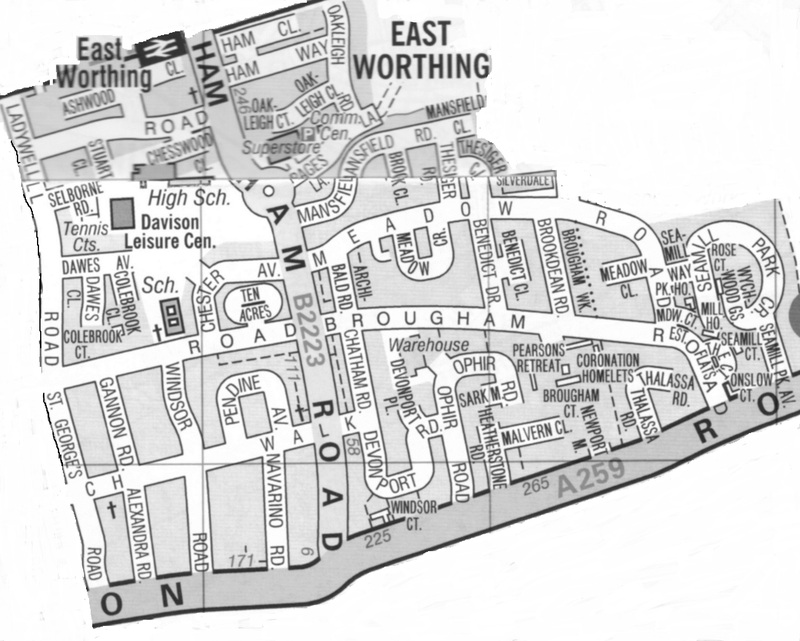 The East Worthing delivery area reaches to the south-eastern outskirts of Worthing, and is situated south of our Broadwater and east of our Central Worthing delivery areas. It is situated between the main railway line to the north and both part of the A259 (Brighton Road) and the coast to the south. 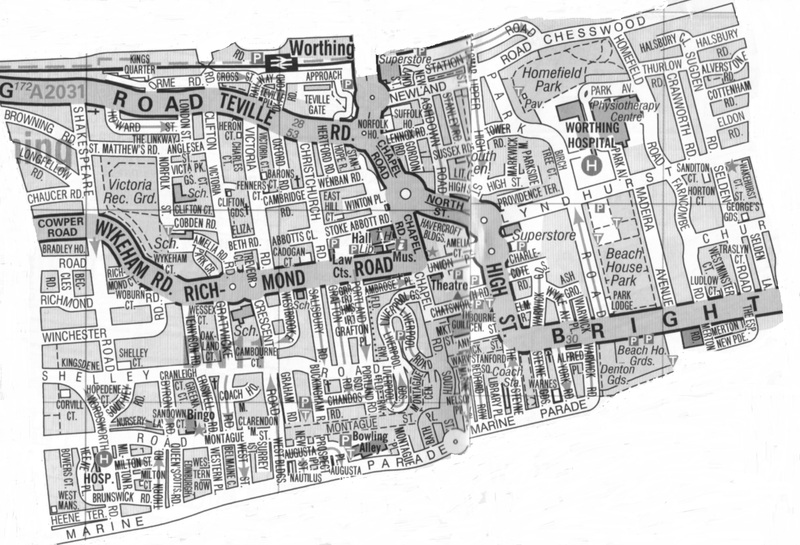 Leaflets & flyers are delivered to a total of 5,000 households in the West Worthing area. 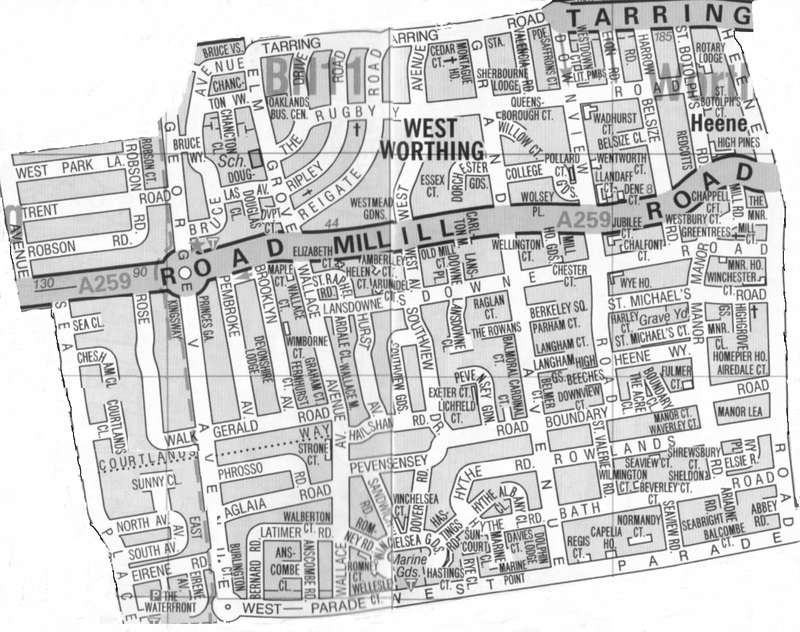 The West Worthing delivery area is situated east of our Goring-by-Sea, west of our Central Worthing and south of our Tarring delivery areas. It includes part of the A2033 (Tarring Road) to the north, parts of the A259 (Mill Road), plus Heene Road on its eastern fringe, with the coast to the south. 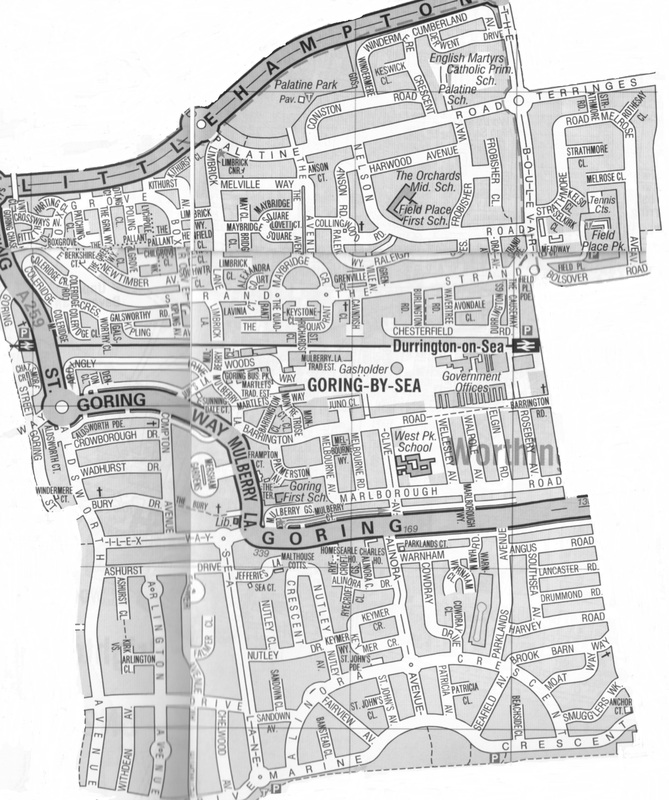 Leaflets & flyers are delivered to a total of 5,000 households in the Goring-by-Sea area. The Goring-by-Sea delivery area reaches to the south-western outskirts of Worthing, it is situated south of our Durrington, east of our Ferring and west of our West Worthing delivery areas. It is south of the A2032 (Littlehampton Road), north of the coast and includes part of the A259 (Goring St., Goring Way, Mulberry Lane & Goring Road). 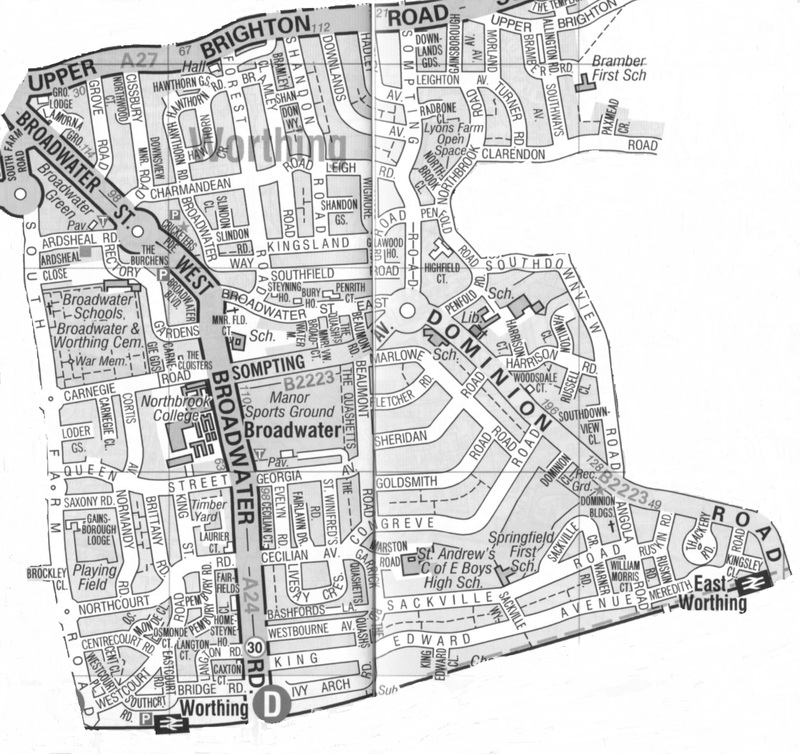 Leaflets & flyers are delivered to a total of 5,000 households in the Broadwater area. The Broadwater delivery area reaches to the north-eastern outskirts of Worthing, and is situated east of our Tarring and north of our Central Worthing delivery areas. It is situated between the A27 (Brighton Road) to the north and the main railway line to the south, included in the area is part of the A24 (Broadwater Street West & Broadwater Road), the B2223 (Dominion Road & Ham Road), plus South Farm Road on its western fringe. 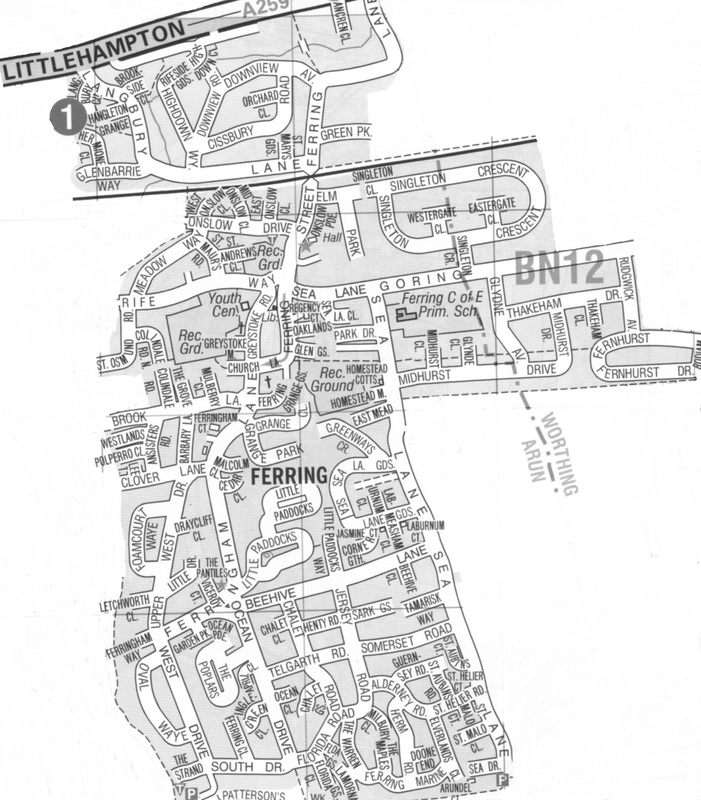 Leaflets & flyers are delivered to a total of 2,000 households in the Ferring area. The Ferring delivery area is to the west of Worthing, whilst it includes a very small part of Goring-by-Sea, which is within the borough of Worthing, most of the area is formed by the Parish of Ferring, which falls within the district of Arun. The area reaches north up to the A259 (Littlehampton Road) and south down to the coast.